P26S-P26F Extender is a debug andtesttool to extend ExpressCard slot from MiniCard (mPCIe) slot. Design the FFC (Flat Flexible Cable) cable for flexible use. The extender is designed to minimize the signal degradation effects of the extender by proven design techniques. Do NOT hot-swap ExpressCARD adapter to avoid the possibility of data lost! Please apply “safety removal” before removing ExpressCard. Especially hot-swap of PCIe type Express Card is not supported. 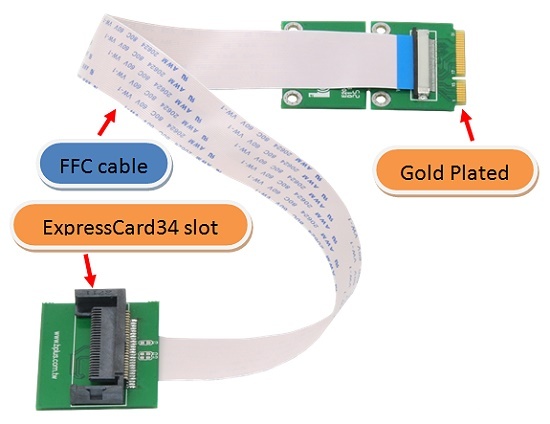 If MiniCard slot on the host does not support PCIe or USB interface, ExpressCard with the interface can not be supported. Maximum speed of PCIe2.0 (5Gbps) is not guaranteed. 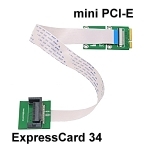 Click the button below to add the P26S-P26F (ExpressCard34 to MiniCard Extender) to your wish list.